Beach front 2 BR 2B + new leather sofa-sleeps 6-pet friendly amazing location!! Enjoy breakfast on your own PRIVATE screened balcony as you watch the pelicans dive for food, or even catch a glimpse of DOLPHINS swimming! Yes we're Gulf Front and even pet friendly ! AMAZING SUNSETS! We even have a security door to enter the building and pool. "WONDERFUL PLACE TO STAY. WITH EVERYTHING YOU COULD ASK FOR." wrote guests in our welcome book, with TWO full bathrooms. Voted 6th happiest island town in America!! And yes-we are ocean front with no street to cross. Swim in our private HEATED pool. We have 3 TV's including a Smart HD 42" in living room. WI-FI? Of course. We even have a security door to enter the building and pool. Anna Maria Island is a 7 mile long Island composed of 3 small connected towns in which TripAdvisor called "the most underrated beach town in America!! You can contact Norman & Linda to confirm availability if you wish.
. "PARADISE!!!! "two guests have called our second home. 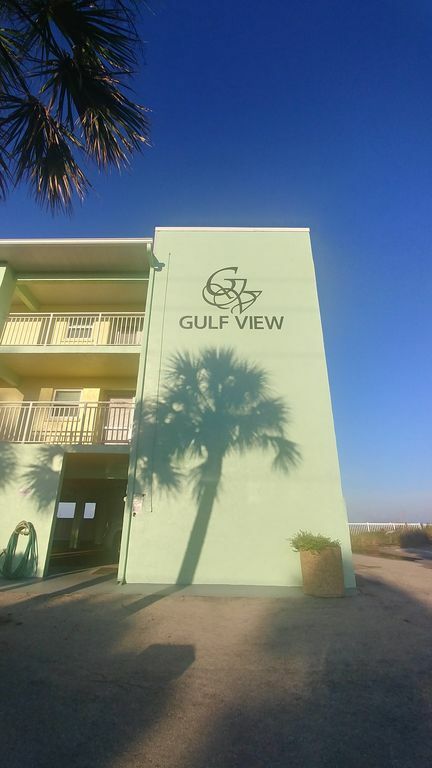 From a former guest: I "have been to Marco, Sanibel, Captiva, even Cabbage Key, Panama City, Destin, Orange Beach and several other beach locations over the past 3 years and this has been the best of all so far"
"GREAT HAVING TWO PARKING SPACES UNDER THE BUILDING" from another guest. Walk to ten restaurants.Fish from the pier! Shop on the historic Bridge ! AND- a free trolley to see the whole island! There's a king size bed in the Master(and the bed is really comfortable!) and two twins in the 2nd bedroom, all fully tiled with three TV's. Remember, this is our 2nd home and we furnish it that way!! And a new QUEEN lather sleeper sofa in living area too. We provide the kids with beach toys and you can use our rafts and beach chairs. For the more adventurous there's even parasailing or jet-skiing, and Linda and I love the tree covered bike\walking path a block away! Our home is beautifully decorated with a great Florida feel. There's a washer and dryer,fully equipped eat-in kitchen, propane bbq, and even a grocery store across the street. And a marina to rent boats just a block away!! And even miniature golf down the block. "THE VIEW OF THE GULF OF MEXICO FROM OUR PRIVATE BALCONY WAS STUNNING!" said another. Want to get in the car? Golf, shop the famous St.Armand's Circle 15 minutes away, or even Disney World. Linda & I promise you will not be disappointed! We even welcome your small pet!!! Why do we call it Flamingo Condo? Come see! And read the reviews! PS Weekly rental minimum, Feel free to contact us directly . Keywords: Ocean front. Beach front. Pets allowed. Linda and I have been here for over 25 years and love it.When you're not, we are! Always wanted an ocean front place and this is what guests call the 'million dollar view! 'And we adore flamingos--as you'll see when you arrive. East coast busy, waves big, surf cold. West coast friendly, waves small, surf warmer.No MacDonalds, but lots of specialty restaurants- French, American, Italian and even ice cream a block or two away! INCREDIBLE SUNSETS. Nine mile walking beach, fish from the bay or the ocean.Free trolley is wonderful and the island is sooooo laid back.Kids love the new miniature golf course and adults can rent a boat,wave runner,scooter or go para-sailing. Both recently renovated. One with shower, 2nd with tub.All towels provided. Plenty of extra. Let the waves put you to sleep! Bring our chairs to the beach. Inside the unit-not in a laundry room. New. Of course, why should you bring any? Seats four plus two at new counter in kitchen. Brand new! You've got 3. One new 43" smart tv-surf the web! What a view of the gulf! Phones, 3 Cable TVs, Fans in every room. No Smoking building. Don't forget free WI-FI provided-plus plenty of DVD's, books and menus for local eateries. We could not have selected a better place to stay. Well-appointed condo with beautiful gulf views from the lanai, steps to the beach, walking distance to shops and restaurants. Norm and Linda were fantastic, appreciated their insight on the ins and outs of Anna Maria Island prior to our arrival. Looking forward to booking again next year, hopefully for two weeks! Every thing you could want! Beautiful. Comfortable. Everything within walking distance. Couldn't ask for anything more with the beach right there! This condo has the absolute best location on the island, in my opinion. So close to the restaurants, bars, and shops and all with a beautiful oceanfront view. How can you beat having a pool right on the beach? The condo itself was clean and had everything you would need to enjoy your stay. Little touches like condiments and soaps were there to great us. Unfortunately, the red tide cut our stay short, but Norm and Linda were very understanding of the situation and worked with us so that we were able to enjoy our vacation. If we return to Anna Maria Island again I know where I will be staying. Appreciated! Hope to have you return!! The best location, views and accommodations on Anna Maria! We stayed on Anna Maria many times but this condo is the place to be if you’re there. The location is perfect for several reasons: walking distance to everything (convenience store, restaurants, shops, pier fishing) but at the same time it doesn’t feel busy because overall the island is small and quaint. The building itself has only ten units so the beach and the pool area are never crowded. The condo is spacious (plenty of room for our party of two adults and three kids). The master, living room and kitchen overlook the ocean and the views are incredible (we saw dolphins and manatees right out of our balcony). The unit is on the second floor but it didn’t seem like a lot of effort to go up and down the stairs, even with little kids on hand. The building has a secured entry door. The condo is equipped with everything you might need (including all the kitchen ware, TVs with cable and internet). We had our own but owner also provided the access to a storage unit downstairs with chairs and beach toys. The owners are very kind and easy to work with. They quickly responded to our messages and provided lots of helpful tourist information. We are very happy with our two week experience and hope to spend much more time there soon. Thank you Linda and Norm! Thank you for your kind words! We know all future guests will be just as satisfied as your family. Anna Marie Island is a slice of Paardise. After all, we've been there for over two decades ourselves! We enjoyed our stay so much. The condo had a beachy decor and made us feel at home. It was well equipped and the location was fabulous! We hope to visit again. Miniature golf, shopping and restaurants--and a wonderful pier--a block away . And if you want-drive to Disney World about two hours away! There is a small pet fee of $65. Please contact us directly for any other questions and the chance to save! Monthly stays highly discounted. Deposit returned 30 days from departure.